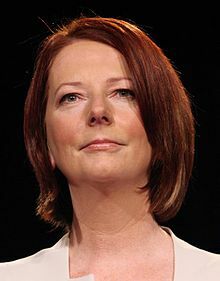 Julia Eileen Gillard (born 29 September 1961) is an Australian politician who was the 27th Prime Minister of Australia. She became the first female Prime Minister of Australia. She was also Australia's first unmarried prime minister. Gillard was the first prime minister not born in Australia since Billy Hughes, who served from 1915 to 1923. Gillard became the leader of the Australian Labor Party on 24 June 2010 when Kevin Rudd resigned. She had been Deputy Prime Minister under Kevin Rudd. On 11 December 2007, Rudd went to the United Nations Climate Change Conference in Bali. Gillard became the first woman in Australia's history to take on the prime-ministerial role as the acting prime minister. Gillard was elected to the House of Representatives in 1988. She represented the Division of Lalor, in western suburbs of Melbourne. Gillard's father was a psychiatric nurse, and her mother worked in a Salvation Army nursing home. She and her sister went to Mitcham Demonstration School, and Julia went on to attend Unley High School. She studied at the University of Adelaide but cut short her courses in 1982 and moved to Melbourne to work with the Australian Union of Students. She graduated from the University of Melbourne with Bachelor of Arts and Bachelor of Laws degrees in 1986. In 1987, Gillard joined the law firm Slater & Gordon at Werribee, Melbourne, working in industrial law. In 1990 at the age of 29, she became one of their first female partners. At the University of Adelaide, she joined the Labor Club and became involved in a campaign to fight state education budget cuts. Moving to Melbourne in 1983, Gillard became the second woman to lead the Australian Union of Students. Gillard was also the secretary of the Socialist Forum. The Socialist Forum wanted to end the ANZUS treaty, making Leningrad a sister city of Melbourne, and increase taxes on rich people. From 1996 to 1998, Gillard was Chief of Staff to the Victorian opposition leaderJohn Brumby She was responsible for writing new rules for the Labor Party in Victoria to increase the number of women elected to parliament. She also played a role in starting EMILY's List, the pro-choice fund-raising and support network for Labor women. Gillard was elected as Member for Lalor in the House of Representatives at the 1998 election, replacing Barry Jones, who had retired. She made her first speech to the house on 11 November 1998. After the 2001 election, Gillard was elected to the shadow cabinet, to oversee population and immigration. In February 2003, she was given reconciliation and Indigenous affairs. Gillard was promoted to the position of Shadow Health Minister in July 2003. Shortly after this, Tony Abbott became Health Minister. The contest between Abbott and Gillard often attracted attention from the media. She also was in charge of opposition business in the House of Representatives. After the Labor loss at the October 2004 election, Gillard was seen as a possible future leader. However she stayed out of leadership changes in the Labor Party. On 1 December 2006, with Kevin Rudd and Gillard launched a challenge for leadership of the ALP. Once Rudd was elected as leader on 4 December 2006, the deputy leader, Jenny Macklin. Gillard was elected unopposed as deputy leader. After the leader ship change, Gillard became the shadow ministe for Employment, Workplace Relations and Social Inclusion. The Labor Party won the 2007 federal election. On 3 December 2007, Gillard was sworn in as the first female Deputy Prime Minister of Australia. She was also the Minister for Education, Minister for Employment and Workplace Relations, and Minister for Social Inclusion. As Minister for Education, Gillard went to Washington, DC, where she signed a deal with the US Secretary of Education, Arne Duncan, to enourage improved policy collaboration in education reform between both countries. On 11 December 2007 she became the first woman in Australia's history to be in the prime ministerial role when she became acting prime minister while Kevin Rudd went to the United Nations Climate Change Conference in Bali. In the first year of government, she served as acting prime minister for 69 days while Rudd was overseas. Gillard is a highly regarded debater, and has been described as "the best parliamentary performer on the Labor side". Gillard removed the WorkChoices industrial relations laws introduced by the Howard government, and replaced it with the Fair Work Bill. This set up a single industrial relations bureaucracy called Fair Work Australia. In 2009 Gillard was in charge of the government's "Building the Education Revolution" program, which gave AU$16 billion to build new school classrooms, libraries and assembly halls. During 2010 Rudd's level of support dropped in the opinion polls. Labor politicians were unhappy with the way he led the party. The media had a lot of stories about the possibility that he would be challenged as leader. On 23 June 2010, there were several meetings between Gillard and Rudd, as well as other Labor party leaders. Rudd spoke to the media and said that Gillard had asked him to resign or hold a new vote for the party leadership. This would decide who was to be the leader of the Labor Party and therefore the Prime Minister of Australia. At first Rudd said he would challenge Gillard at the meeting. However, hours before the vote, he resigned as leader when he knew that he did not have enough support to defeat Gillard. She won the election unopposed and became Australia's 27th Prime Minister. At the same meeting the Treasurer, Wayne Swan, was elected unopposed to succeed Gillard as Labor's deputy leader, and hence Deputy Prime Minister. Gillard said that "It is my intention to lead a government that is focused each and every day on meeting the needs of working families around the country". She said "I came to the view that a good government was losing its way". In February 2012, Rudd resigned as Foreign Minister, and said that he would challenge her for the leadership of the Labor Party. Gillard called a party meeting on 27 February 2012 and asked for a new leadership vote. She won the leadership, getting 71 votes to only 31 for Rudd. On 26 June 2013, Gillard called a leadership spill. Kevin Rudd declared himself as a candidate. Rudd defeated Gillard by 57 to 45 votes. After the results, several ministers resigned from their ministerial positions including Wayne Swan, Peter Garrett, Greg Combet, Joe Ludwig, Craig Emerson and Stephen Conroy. In accordance with the pledge she and Rudd made in the vote, Gillard announced that she would not seek re-election and announced her retirement from politics at the upcoming federal election. Gillard is a member of the Left faction of the Labor party. Analyses of Jacqueline Kent's 2009 biography of Gillard suggest that her membership in the faction is "more organisational than ideological". On population policy, in contrast to her predecessor, Gillard is against a "big Australia". She emphasises the need for sustainability, saying "Australia should not hurtle down the track towards a big population". Gillard is pro-choice on reproductive rights. She does not support gay marriage. Gillard's partner since 2006 is Tim Mathieson. She had previous relationships with union officials Michael O'Connor and Bruce Wilson and fellow Federal Labor MP Craig Emerson. She has never married and has had no children. When asked in 2010 on the ABC's Jon Faine program, "Do you believe in God? ", Gillard answered, "No, I don't Jon, I'm not a religious person ... I'm, of course, a great respecter of religious beliefs but they're not my beliefs". Newly appointed Prime Ministers must take an affirmation of office, or swear an oath of office on the Bible. Gillard chose an affirmation. She lives in the south western Melbourne suburb of Altona and is a public supporter of the Western Bulldogs Australian Rules Football club. ↑ 1.0 1.1 Wright, Tony (2 January 2008). "Forget Canberra, Altona has become the new heart of the nation". The Age. Fairfax. Retrieved 5 October 2008. ↑ 3.0 3.1 Lunn, Stephen (25 June 2010). "Let's wait and see on marriage, says Julia Gillard's partner". The Australian. News Limited. Retrieved 25 June 2010. ↑ 4.0 4.1 Kerr, Christian; Franklin, Matthew (24 June 2010). "Julia Gillard 'honoured' to become prime minister as Kevin Rudd stands aside". The Australian. News Limited. Retrieved 24 June 2010. ↑ 5.0 5.1 Kerin, Lindy (10 December 2007). "Gillard makes Aust history as female acting PM". ABC News. Retrieved 24 June 2010. ↑ 6.0 6.1 "The Hon Julia Gillard MP, Member for Lalor (Vic)". Australian House of Representatives. Retrieved 24 June 2010. ↑ 7.0 7.1 7.2 "Australian Story - Julia Gillard Interview Transcript". abc.net.au. 6 March 2006. Retrieved 21 May 2013. ↑ "Julia Gillard in Person". Counterpoint. Radio National. 20 September 2004. Transcript. ↑ "Gillard addresses students at former high school". ABC News. 14 December 2006. Retrieved 23 June 2010. ↑ Simons, Margaret (16 February 1983). "Room at the top on the campus". The Age. Fairfax. Retrieved 25 June 2010. ↑ "Julia Gillard". History of the Melbourne Law School. University of Melbourne. 24 June 2010. Retrieved 24 June 2010. ↑ 13.0 13.1 "The Other Biography: Jacueline Kent's "The Making of Julia Gillard" by Christine Wallace". The Monthly. Schwartz Publishing. October 2009. Retrieved 19 October 2009. ↑ Davis, Mark (24 June 2010). "Focus and ambition drive her success". theage.com.au. Retrieved 21 May 2013. ↑ Mayes, Andrea (10 August 2007). "Julie Bishop and Julia Gillard clash". Perth Now. Retrieved 23 June 2010. ↑ Wright, Lincoln (7 August 2007). "Will Julia Gillard's past cause red faces?". Sunday Herald Sun. News Limited. Retrieved 23 June 2010. ↑ Gillard, Julia (2003). "Personal Perspectives on Parliament Lower House: Lower House" (PDF). One Hundred Years of Women's Suffrage in Australia, Centenary Issue. Commonwealth of Australia. p. 34-36. Retrieved 29 June 2010. ↑ Summers, Anne (25 June 2010). "Historic moment, but barriers remain for half the population". The Age. Fairfax. Retrieved 26 June 2010. ↑ "Ms Julia Gillard MP, Member for Labor (Vic), First speech to Parliament". Australian House of Representatives. 11 November 1998. Retrieved 18 May 2007. ↑ "Crean names new team". ABC News. 18 February 2003. Retrieved 24 June 2010. ↑ Hudson, Phillip (2 July 2003). "ALP rising star for key health role". The Age. Fairfax. Retrieved 24 June 2010. ↑ Wroe, David (30 September 2003). "Doctor groups hail promotion of 'head kicker'". The Age. Fairfax. Retrieved 24 June 2010. ↑ Banham, Cynthia (3 December 2003). "Gillard's loyalty pays off". The Sydney Morning Herald. Fairfax. Retrieved 24 June 2010. ↑ Grattan, Michelle (22 January 2005). "Beazley no to Gillard as deputy". The Age. Fairfax. Retrieved 24 June 2010. ↑ Hudson, Phillip; Coorey, Phillip (1 December 2006). "Rudd, Gillard confirm challenge". The Sydney Morning Herald. Fairfax. Retrieved 24 June 2010. ↑ Coorey, Phillip (5 December 2006). "We'll rebuild nation, says Rudd". The Sydney Morning Herald. Fairfax. Retrieved 24 June 2010. ↑ Grattan, Michelle (11 December 2006). "Plums for Rudd men in shadow reshuffle". The Age. Fairfax. Retrieved 24 June 2010. ↑ Marriner, Cosima (26 November 2007). "Gillard reveals: it was the go-girl factor". The Sydney Morning Herald. Fairfax. Retrieved 24 June 2010. ↑ Harrison, Dan (19 October 2009). "Ms Gillard goes to Washington". The Age. Fairfax. Retrieved 19 October 2009. ↑ Norington, Brad (24 November 2008). "Business as usual for Gillard the caretaker". The Australian. News Limited. Retrieved 23 June 2010. ↑ van Onselen, Peter (14 March 2009). "Shorten pathway to a Gillard future". The Australian. News Limited. Retrieved 23 June 2010. ↑ Viellaris, Renee (20 March 2009). "WorkChoices finally dead: Julia Gillard". The Australian. News Limited. Retrieved 23 June 2010. ↑ "PM promises not to extend Work Choices". The Age. Fairfax. 15 October 2007. Retrieved 13 November 2007. ↑ Bita, Natasha (10 September 2009). "Grant to trail girl to next school". The Australian. News Limited. Retrieved 23 June 2010. ↑ Bita, Natasha (22 October 2009). "Julia Gillard to reclaim school payouts". The Australian. News Limited. Retrieved 23 June 2010. ↑ 36.0 36.1 36.2 36.3 "Australia has first woman PM as Gillard replaces Rudd". bbc.co.uk. 24 June 2010. Retrieved 22 May 2013. ↑ Harvey, Michael (23 June 2010). "Federal Labor MPs moving to axe Kevin Rudd and replace him with Julia Gillard". Herald Sun. News Limited. Retrieved 23 June 2010. ↑ Davies, Ben (10 July 2010). "Enough with the 'working families' already". spectator.co.uk. Retrieved 22 May 2013. ↑ Levy, Megan (27 June 2013). "'Most shocking political backstabbers': Rudd's comeback makes headlines around the world". Canberra Times. Retrieved 5 July 2013. ↑ Peatling, Stephanie (27 June 2010). "Don't hurtle towards a big Australia: PM". Sydney Morning Herald. Fairfax. Retrieved 27 June 2010. ↑ "Gillard shuts door on 'big Australia'". ABC News Online. Australian Broadcasting Corporation. 27 June 2010. Retrieved 27 June 2010. ↑ "Gillard warns on abortion funding". The Age. Fairfax. 3 February 2005. Retrieved 27 June 2010. ↑ "Gillard does not support gay marriage". 7 news. 30 June 2010. Retrieved 30 June 2010. ↑ "Gillard's partner Tim Mathieson 'bubbly'". The Sydney Morning Herald. Fairfax. 24 June 2010. Retrieved 24 June 2010. ↑ Valent, Dani (18 May 2007). "Our Julia". The Age. Fairfax. Retrieved 26 June 2010. ↑ "Gillard defends childlessness". The Australian. News Limited. 17 January 2007. Retrieved 31 August 2007. ↑ Maley, Jacqueline (26 December 2009). "Catholics divided in the House". The Sydney Morning Herald. Fairfax. Retrieved 24 June 2010. ↑ "Gillard won't play religion card". ABC News. 29 June 2010. ↑ Hazell, Malcolm (3 December 2007). "Swearing-in ceremony for Ministers and Parliamentary Secretaries". gg.gov.au. Retrieved 30 June 2010. ↑ "Commonwealth Of Australia Constitution Act". aph.gov.au. 21 May 2003. Retrieved 30 June 2010. ↑ Berkovic, Nicola (24 June 2010). "Women in power as Julia Gillard sworn in as Australian Prime Minister by Quentin Bryce". The Australian. News Limited. Retrieved 26 June 2010. ↑ McNicol, Adam (24 June 2010). "Dogs celebrate fan Gillard's ascension to PM". afl.com.au. Retrieved 25 June 2010. Wikimedia Commons has media related to Julia Gillard. This page was last changed on 18 March 2019, at 23:12.